A group of kids, a bunch of mysterious events, a secret beneath the surface of a town and a friend who has vanished. You might think we are talking about Stranger Things but we’re not. The developers in Question could have gotten their inspiration from the Netflix hit series, because this title’s description sure does ring a bell. The Blackout Club is a new first-person co-op horror game currently still in Early Access on Steam. With a story we know has potential, we were wondering if this game could be our new late night addiction. The story revolves around a group of teenage friends investigating a monstrous secret beneath the skin of their small town Redacre, Virginia. They can’t count on adults since they don’t believe them. Some teenagers have woken up during blackouts, finding themselves in the woods or on train tracks with no idea how they got there. 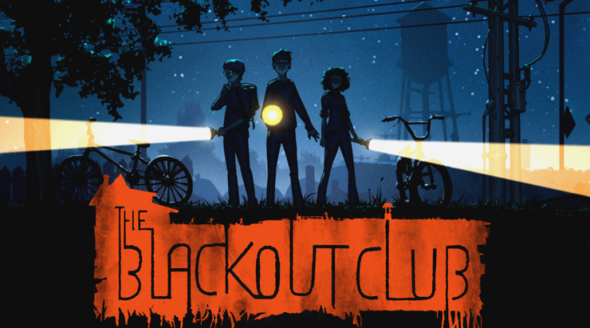 Some brave kids decide to take matters into their own hands and form The Blackout Club to get to the bottom of these mysterious events. To make things even worse, a close friend has disappeared, making this a dangerous and deadly mission. With a game like The Blackout Club, a story has a rather big importance. Luckily, the story we are given here is interesting. On top of that we are presented with the story in a fun way; through the starting up of the game. During the tutorial we learn more about the disappearance of the missing friend, Isabella. The game uses 3D graphics. Your adventure takes place in a small town called Redacre, Virginia and makes you scout the neighborhood, the surrounding woods and a network of tunnels underneath the town. Details are implemented everywhere, making sure the game looks beautiful. Even though the graphics aren’t even close to looking like real life graphics, it’s an enjoyable look that gives sufficient pleasure. The sound is pretty much as it should be in a horror game. The background music is creepy and mysterious, keeping you on the edge at all times. Your enemies’ voices are echoing through the environment while you’re trying to hide. These voices are scary but nothing too special, it’s not like they’re terrifying. The Blackout Club is a first-person co-op horror game. Sessions include 1 to 4 players who can drop in and out at any time. You can only play the game online, which is a pity since you’re able to play alone online. Building in an offline option would definitely be a plus. When launching the game, you can chose to play the tutorial first, which is recommended by the game itself. 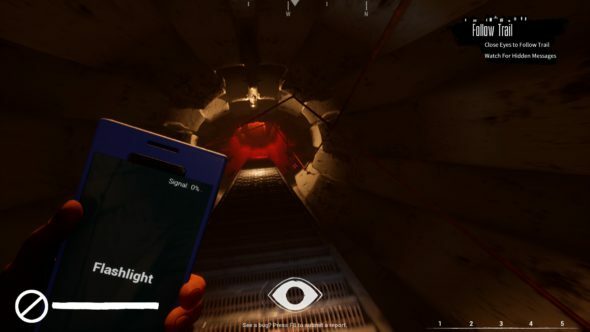 We do have to agree with the developers on this; not only does the tutorial get you familiar with the controls, it also gives a little insight in how Isabella disappeared. Your ‘menu’ is the blackout club’s hideout. Here you can walk around freely. You can for example go to the clothing rack which is the ‘change appearance’ option. Of course, here you can make your own character. The basic choices are presented at the start and the more you level up, the more new clothes and gestures you’ll be able to unlock. Other options include seeing the leaderboard, picking a weapon and picking a power. 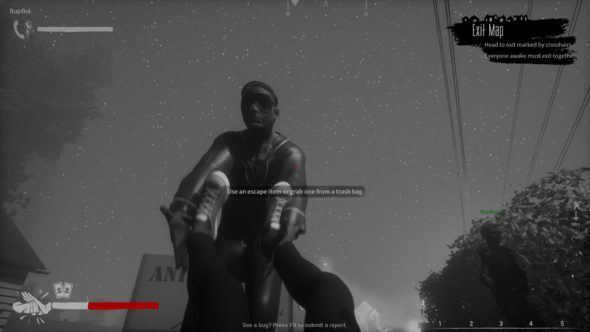 You get a bar of stamina, which you can use for several actions such as running. When an enemy catches you, you get wounded and lose some of your maximum stamina. Your goal is to finish missions like collecting evidence to prove what is happening is real or retrieving a club member that’s been abducted. 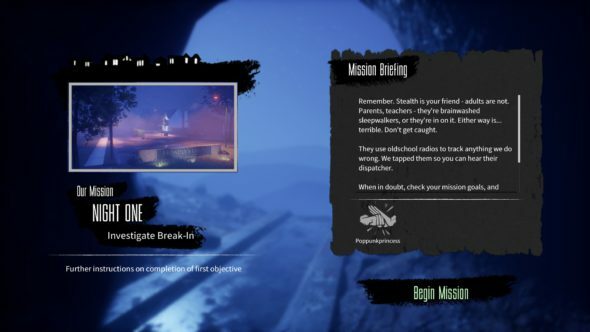 Your mission objective will always be shown on the top right of your screen in case you don’t remember what you have to do or how far along the mission you are. The mission fails when all players are captured by The Shape. Most of the time you’ll have to rely on stealth in this game. Try to stay low and avoid your enemies. These include Sleepwalkers, Lucids and The Shape. Your stealth indicator at the bottom of your screen indicates if you’re seen or heard. Sleepwalkers are blind but have great hearing. You can either attack them by jumping on them from behind or you can try to avoid them by staying still, crouching or walking on soft grounds like carpets. Lucids are a bit more tricky. They see and hear and are very fast. You can also jump them from behind, knocking them out for a short while. As you’ll soon notice, you’re not killing Sleepwalkers or Lucids. This is because these creatures roaming the streets are actually just the adults of the city and you don’t really want to hurt them. When you are too wounded to fight off your opponents, you get dragged away by them. Even then you still have an opportunity to escape by grabbing something from the trash and using it on your enemy. Now, the real deal is called The Shape, which will come after you if you draw too much attention to yourself. It cannot be seen by the naked eye and only becomes visible when you close your eyes. Closing your eyes will make you see a red kind of haze and sometimes shows a human-like shape moving around. The difference between this creature and the brainwashed adults walking around in town, is that you cannot take down The Shape. The only option you have is to run and hope it doesn’t catch you. If he does catches you, you become one of his servants, helping him catch other players. Besides stealth, weapons come in handy during the game. For example, you can pick up the crossbow or use grappling hooks. This comes with a single tranquilizer dart. On the table that displays the weapons, you’ll also find some tools you can use. A fun tool to use is the can of goop which you can throw down to ensure a soft landing. Powers are also very important when you go out on a mission. You have to choose well here, since you can only pick one every time you go outside. The major powers include a takedown (take down Sleepwalkers), hacker track (hack cameras and mines), unstoppable power track (become immune to being wounded for a few seconds) and drone using (survey the land). Besides these powers there are also some minor powers like picking up ammo. Powers can be upgraded by using points you earn from leveling up. On every new mission you go, you’ll find different enemy patrols, loots will be in different places and environmental obstacles will vary. This tries to avoid the problem of repetitiveness. However, after you’ve played some missions you’ll start to recognize the same places and patrols. 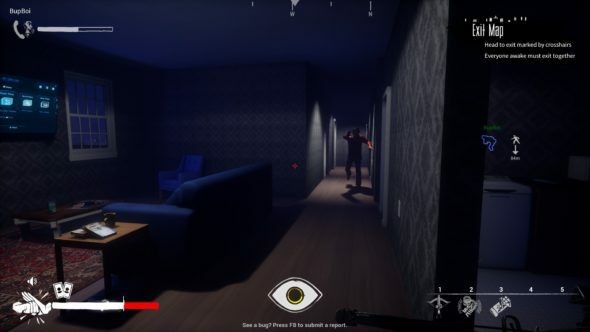 This game could just give you a few jump-scares, but don’t expect too much of it. The scary parts usually happen when The Shape is about to catch you or when you feel like you’re about to get caught. For a game that’s still in Early Access, The Blackout Club already has some great assets, with its beautiful yet scary surroundings, perfect sound plus voice acting and some fun gameplay. We’re hoping the developers can keep up the pace and create an even better game in the end. An offline mode would be welcome, as well as some new surroundings and obstacles to cancel out the repetitiveness a little more. And if they claim to be a horror game, a few more jump-scares and even heart-racing moments might be in place.